2. No sales or any kind of market promotion. 3. Focus on the tennis technique only please. For those who are not familiar with this subject, it was said, (written in the book, see picture), that the optimum contact point for a (topspin drive) groundstroke is to hit below the sweetspot. 1. Which current pros (men or women), or retired pros, hit like this? (consistently). 2. Any up-coming juniors are being taught to hit this way? If you could please give a bit more detail reason. Thanks. This was not an article, but rather a page of a relatively popular tennis book. In my humble opinion, that's the optimum contact point for hitting the ball into the bottom of the net. Not saying you are wrong, also not saying these guys are doing this on purpose (see pictures). But you can't hit dead-center all the time. (if image doesn't work let me know). OP, which book is this? Does TW sell such a modern racquet with a modern sweetspot that extends to all the mains? I would like to buy one. Try the ProSupex Uniflex MP3... I really liked that frame... just didn't like the look of it. It sounds like "instant noodle" or "lottery ticket" to me. <<Play Better Tennis in 2 Hours>>. What is that Volk racket in that picture? I have high speed footage of several pros. These are vids I took this year at the Sony Miami. Not one pro hits in the manner described in this book. NOT ONE. Lastly, as I have pointed out several times, the author is grossly incorrect in defining the ENTIRE STRING BED of the frame as the "modern sweet spot". he is full of it. My Prince Exo 93 has a bigger sweetspot according to the tools. Must be due to the extra weight. But neither has the modern sweetspot shown in the picture. I think the military has taken over the technology once it was revealed in that book, and is keeping it classified. On the page which OP has displayed, there is a reference to "a revolution in tennis teaching." Yes, 93 is the qualifier. There is a 100 which seems to be an entirely different racquet. Still photos are not a good medium for describing an action sequence. Virtually all of the context is missing and cannot, IMO, be adequately replaced by a narrative. Photos in a text are primarily illustrative, and designed to give the reader a visual representation of what the author is talking about, and not vice versa. "The map is not the territory". That's why, IMHO, seeking to learn from a competent instructor is so important. There are so many nuances and progressions involved in gaining mastery of a technique that also have to be constantly adapted for individual eccentricities. You just can't get that out of a book. Books are very helpful, don't get me wrong. However, books simply mirror human interactions (even scientific texts deal with the human perception of the world around us). You can't remove the human element from the equation. For the same reason, Drakulie's video streams are more valuable. The action sequence is largely intact and, given good camera angle, etc., there is less information to fill in or interpret. I'm no expert on photography, but it also seems to me that still pictures present interpretative problems with varying focal planes and a lack of dimension. The focus on one object results in less resolution for things around it that are in a different proximal relationship to the camera. When you consider these factors together with the inherent lack of context in still photography, I think you have a situation ripe for the creation of optical illusions. Personally, I think this hypothesis offers more of an explanation for those bizarre pictures of Sam Querry in the racquet-flipping thread. I like pictures, just like the next guy or gal, but IMO, you have to be careful about the conclusions you draw from them. Pictures are most helpful where you already have quite a bit of information about the process and perhaps, an experiential base to draw upon. I would certainly regard pictures as less than determinative where the process itself is in doubt. At least the detractors of OW should be happy. I think the boards have finally highlighted at least one area in which his teachings radically depart from mainstream tennis instruction. OP, the racquet in the photo looks very much like the old Volkl Catapult 10. That frame was a midplus, gray in color, with a thin, white pinstripe IIRC. I've asked this question 14 times and have yet to get an answer from Wegner, or any of his cult followers. MChang, since you have a sincere interest in this, I'll point out several flaws in the above post, as these flawed ideas seem to dominate the discussion by the detractors of Oscars statements about hitting lower on the sweet spot. 1st- Drak does not have and has not studied, anywhere near a reasonable sample size to draw any reasonable conclusion, and has picked a few pics to try and support a conventional conclusion. Oscar has studied an incredible # of strokes over decades, and under a variety of conditions and racket sizes, with eyes of a touring pro and National/International coach. 2ond- Drak seems to have no understanding of what a sweetspot is, even using conventional terms. The sweetspot for each racket and even different strokes; is different and has to do with where a ball can be struck with the racket giving a solid and powerful FEEL. There is not one sweetspot and it is rarely if ever in the center of the stringbed. Oscar's pic shows a large area to account for this variety. The INTENT and PURPOSE of the pic is to focus on where the ball is striking, right below the strng bed center, and not to define the sweetspot for that racket! The pic is made into a larger oval to demonstrate a grouping of some of the sweetspots that can be encountered in different situation, and is not intended to depict a sweetspot on any one swing or racket. Science approximates the Idea of a sweetspot in terms of power return in a more sterile state (clamped, not swung usually), not accounting for different grips or swings. It does not account for Feel, which is the primary aspect of a traditional sweetspot, except to occasionally look a vibrations. 3rd- His last point of saying Oscar's sweetspot is the entire stringbed is the most obvious and clear mis-info, as all can see the area outside the circle, while appearing small, would measure well over 100sq in I expect. 4th- If you look at the TW power return diagrams, you will see that the area that Oscar recommends for groundstroke impact (intent of pic) sort of straddles the red/blue areas, which are the power areas of the stringbeds unless you start to really get lower towards the throat (which is the most rare area struck IMO). as all can see the area outside the circle, while appearing small, would measure well over 100sq in I expect. Since the racquet looks like it is 100 or 105 sq in in head size, that means the modern sweetspot is 0 or 5 sq inches, yet touches all the mains and almost all the crosses. As I said, this is a very unique racquet, possibly left here by an alien spacecraft, and seized by the military. Could you quote your ref on where the modern sweetspot is only 0-5 sq in?? first, someone who focus on which string he will hit the ball is overanalysing a little bit. then, if you apply topspin and your initial contact point is already below the center, your will probably end up framing it. Upon reviewing the source material, Play Better Tennis in 2 Hours, I find myself unsure of what is actually being said or propounded as a teaching/learning tool. There is an interesting two-volume set of tennis instruction/coaching techniques published by the German Tennis Association entitled, simply, Tennis Course. Originally published in 1995, this was made available in English by Barron's in 2000. Volume 1 deals with "Techniques and Tactics". Pages 43-44 concern the ball's contact with the racquet face and ensuing trajectory. Two scenarios are presented: (1) the racquet strikes the ball directly on center, transferring energy to the ball with no spin, and (2) the racquet strikes the ball off center, creating spin. Hardly earth shattering, this is just a fundamental description of how the racquet imparts spin to the ball. What strikes me however, is that traditional tennis instruction speaks, understandably, in terms of the racquet striking the ball, whereas Oscar Wegner, at least in this particular instance, is placing emphasis on the ball striking the racquet. I'm wondering whether the author is simply advocating the application of topspin to a hard hit return by the opponent, only using what appears to be a very backward explanation? After all, using topspin to control a hard hit ball is a better percentage play than trying to return it flat. And dealing with hard hit balls is the subject of the chapter. Is this mostly a communicaton issue, because the chapter is not especially well written, and English does not appear to be the author's native tongue? Or is Mr. Wegner actually advocating using a particular part of the stringbed to strike the ball and recommending that players attempt this? 5263, as an MTM instructor, perhaps you could clarify this or offer some insight? I seem to recall that Vic Braden did some research years ago and found that most players, including pros, did not make contact normally on the center of the sweetspot, but tended to go a bit north or south of there (I don't recollect which). It was along the lines of common myths that Vic was fond of busting with his excellent use of high-speed photography. I tried to find the reference, but had no luck. Still, noting what actually occurs in a stroke is a far cry from recommending that someone attempt to consistently strike the ball in a particular area of the sweetspot, let alone the stringbed. But then again, I'm not sure that's what Oscar Wegner is really saying. FWIW, I'm not necessarily a proponent of MTM. I often make references to the "modern game", but do so only to contrast my classical training and traditional style of play with the more "modern" tendencies to hit groundstrokes from an open stance with excessive topspin. I have Oscar Wegner's book in my library, sitting not too far from several of Vic Braden's works. I have found Play Better Tennis in 2 Hours to quite helpful on occasion specifically because the author does offer a different explanation and emphasis on some common principles. It sometimes aids understanding greatly to use different words in an explanation or to come at a subject from another point of view. While I don't endorse MTM, I don't seek to diminish it either. I'm open to learning from all sources. Great Post you made here and nice background. Honestly, while I'm not interested in dismissing Oscar's take on hitting below the sweetspot on GS, it's not something I take a lot of interest in, which is a big reason I have avoided answering several questions about it. I have looked at it as something that can be related to a steep topspin swing, and as something that a player finds thru lots of reps, but not something to strive to do. Maybe this is wrong?? I don't think this is something that Oscar teaches to do, but states that it is something that often happen for better TS shots with pros. What does often mean in this case? Can't say. I don't think it is a big issue, other than for someone trying to find something to disagree with. always nice to converse with an objective poster! 5263, Thank you, sir! You summarized pretty accurately what I was thinking. While I'm always fascinated by why and how things happen, that doesn't always result in useable information. Speaking for myself, this does appear to be one of those areas which, after scratching my head, I just remount my cap and move along. No big deal. Thanks again for responding to my question and for your contributions on TT. as opposed to something that is a training goal. Oscar may have more to say on it if I'm off base too much here. Perhaps one could find examples of top players hitting with various areas of the string bed rather than one specific spot. What would this contribute to the debate? I'm open to learning from all sources. Thanks, that is what I am trying to do with this thread. I don't think this is something that Oscar teaches to do, but states that it is something that often happen for better TS shots with pros. 5263, could you please stop talking this name please? I am not interested in who invented this technique. That is why I don't even mention who wrote the book. I am only asking if this is valid technique, and whether it is being taught/used on the pros tour. And my question has not been answered yet. Perhaps one could find examples of top players hitting with various areas of the string bed rather than one specific spot. That is what I suspect. All the evidence points to this, so far. INTENT and PURPOSE of the pic is to focus on where the ball is striking, right below the strng bed center, and not to define the sweetspot for that racket! Thanks. I think this is what the Author tried to deliver to the readers. We know your views already. You are the naughty one in the Oscar group. You never really believed in Oscar, did you? hehehe. I bet you don't teach modern tennis at all. I also suspect most MTM coaches don't, but just use it as sort of a credential to distinguish themselves from other coaches. Xenakis and OP, I'm not sure if more pictures would be beneficial. For reasons previously cited, I have a lot of problems with still photography being used to support a particular contention. High speed photography is useful, yes, but it really needs to be done, IMO, in the format pioneered by Vic Braden, which precludes any actual footage of tournament play. I'm not even sure if there is a debate here. There has been a lot of critical examination of some very brief statements by Oscar Wegner in his book Play Tennis Better in 2 Hours. Much revolves around the interpretation of statements by others that may not even reflect the intentions of the author. I think everybody is in agreement that tennis players, including the pros, are likely to use all areas of the stringbed at one time or another during play. The question originally, as I understood it, was whether a prominent teaching professional (Mr. Wegner), had proposed players try to hit a particular area of the stringbed during groundstrokes (i.e., the lower portion of the sweetspot). To encourage someone to strive for this would indeed be revolutionary, and it is what drew my interest. After re-reading the quoted material in context, and receiving input from 5263, who is an MTM instructor, I really don't believe this is the case. The tennis professional that instructs my 15 year old hails from Brazil. He is USPTA/PTR certified and speaks very good English. Still, there are times when his prose lapses and I find myself wondering what the heck he just said. If I think it's important, I'll ask him to clarify. Sometimes the meaning will dawn on me. Other times, I'll figure it just doesn't matter that much in the end, and carry on. This seems to me to be one of those occasions. If Oscar Wegner, the author, did intend a radical departure in the thinking about how a ball does and should contact the racquet, I'm sure we'll hear more at some point in the future. BTW, I'm a big fan of David Nalbandian. I regard him as an exceptional tennis talent, a fine gentleman, and wish him the very best in 2010. I'll be plugging for him in the Grand Slams. MichaelChang, thank you.:??? : Here is one of my old tips, accompanied by video that a friend found and forwarded to me. One of the most common mantras in tennis is: hit the ball in the sweet spot. Is that now a misconception of old tech? With the new racquets, this sweet spot has expanded. On the old ones, the size was about 3 inches in diameter. Today it is about twice as large. Regardless of the size of the sweetspot, players today hit either on the sweetspot edge or outside of it. In many instances they almost seem to frame the hit. Why is that? Well, first of all, modern racquets are very responsive. Too responsive in the sweet spot. And quite light, thereby not dependable as to stability. It is much better to hit closer to the edge, especially on groundstrokes. Top players hold the racquet quite loose, and if they hit above the center the racquet tends to open and they overshoot the target. Hitting on the center is too wobbly, a quarter of an inch up and the racquet tends to open, a bit below the center and the racquet tends to close. And that is the secret. Even though players may not know it consciously, they most likely feel it and learn it from experience. The result of low center hits is to keep the racquet closed, and therefore the ball safely in the court. Mind that top players assure net clearance by taking quite a margin above it. Sit at court level and you'll see this aspect of the game. Plenty of net clearance. The problem of overhitting the target is usually hitting too flat. Hitting near the bottom edge of the racquet ensures more topspin, and keeps the racquet closed. The opposite is true for volleys and slice. The contact is then above the center, which helps keep the racquet angle open. On volleys, though, very seldom pros go as close to the frame as they do on groundstrokes. One of the most common mantras in tennis is: hit the ball in the sweet spot. Is that now a misconception OR old tech? Oh man where is drakulie? I think I will not respond at all but just leave it to him. Whenever I say something, the thread gets deleted and then there is no more fun. Suresh, did you check the three videos I attached? Yes I did. You may not remember, but in a deleted thread, I was the FIRST person to bring up this topic. 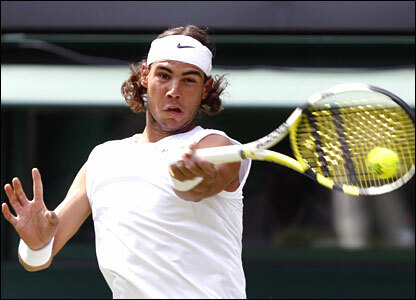 In that post, I said I had noticed that Nadal seemed to hit topspin from the lower half of his frame. If I had not made that post then, we would not be discussing it now. Then drakulie posted video evidence that pros hit all over the frame depending on circumstances, and then others pointed out that where they hit it is not a conscious decision but the outcome of the swingpath, racquet face angle, and so forth. BB is no longer in Hawaii. I will be there though (Big Island) week after Christmas. I did not want to mention it in that thread, but in one of your videos which I viewed from a link once opened up that I don't want to discuss, you said the a similar thing about the twist serve: for a twist, snap your wrist. Now in the above thread, a MTM coach is saying similar to what was in the video - swing slowly before impact, and then use a wrist snap for a twist. This coach is recommending accelerating after the impact, and slow racquet motion before the impact. This is opposite to what is taught. Please answer the above in that thread. Correct, Suresh, and let me thank you first for bringing this fact to the surface. If you look at those videos, you'll see that they sometimes hit anywhere, including above the sweet spot. But if you look at percentages, it's mostly below the center, as you spotted. In the Federer video, which is the last one I posted on that tip, Roger hits a couple above the center and the racquet opens up slightly. But most of the hits are below. And you are right, it is not a conscious decision, it's instinctive, something they learned that feels better, and has better results (they'll know it consciously as well if they are coached by me, Ha Ha). Thanks. I appreciate your input, and the way that we are only, purely, talking about tennis technqiue. Now that you mentioned that pro hitting below the center may not be fully aware of this, but rather based on their feel/experience. I tend to think the same. I think maybe nobody was really taught to hit below the center. Suresh, that posting is incorrect. That happens when someone is trying to explain things from his own viewpoint, without carefully analyzing it. Complications, false data. I am sorry that misrepresents me or my tech. But I don't own anybody, so I just explain it in the simplest way possible, so it's easy to understand, and hoping it is going to be kept simple (and short) so it is easily duplicated by anyone. And the part "Try forgetting everything you've learned. It didn’t work, correct?" is a put down. I object to that. Thank you, MichaelChang. It's a fun game and worth every minute spent on and off the court, learning about people and about the game. I learn new things every day. I have to sign off now, but I will check the thread and your postings tonight. I have a few problems with drawing the conclusion that players are either consciously or unconsciously hitting the baller lower or higher on the stringbed in order to create a desired effect. I find it much more reasonable to explain the fact that there is a tendency to mishit low on the racquet during more extreme low to high swings (though there are certainly plenty of examples of mishits towards the top edge as well) as a consequence of the fact that the racquet is moving in an upward direction at an extreme speed. When you combine this with a ball that is also traveling at an extreme speed, and a racquet that is already approaching the ball slightly closed...it seems reasonable to theorize that most mishits would be low on the strings and not high. You see the opposite in regards to the volley, but not as extreme, because the motion is generally high to low...however the speed of the racquet is generally much lower on a volley than in a topspin groundstroke. I'm also not sold on the idea that the deflection of the racquet after impact has an effect on the path of the ball. The real determining factors are going to be the magnitude and direction of the force applied to the ball. The ball/racquet contact event is very, very short in duration and the ball is off of the strings before any large amount of racquet deflection would occur. Whether or not it would have a noticeable affect on the ball during a very high speed topspin groundstroke...I find doubtful. This is one of the very reasons that the loose grip is a good idea. It allows you to swing faster, and trying to resist the deflection of the racquet is not really helpful anyway. Considering the factors involved...it just seems more reasonable to believe that at those kinds of speeds, people are going to mishit all over the racquet to one degree or another...though they will probably tend to mishit more often in opposition to the direction that their racquet is traveling. OK we will let that go. But what about the twist serve video clip of yours? You recommended swinging slowly before impact, then snapping the wrist. Let us forget the whole wrist snap vs pronation debate and assume you meant one of them, so as not to digress. Then how do you reconcile with the fact that students are taught to swing as fast on the second serve as the first, only putting more spin? If they have a slow swing before impact, and then a hard pronation/wrist snap, is that the technique you are teaching? So the definition has been around a long long time. I guess you are including all head sizes? 93 sq. and above? But I do agree in general that the sweet spot area has increased. Regardless of the size of the sweetspot, players today hit either on the sweetspot edge or outside of it. In many instances they almost seem to frame the hit. Why is that? Well, first of all, modern racquets are very responsive. Too responsive in the sweet spot. And quite light, thereby not dependable as to stability. Which racquets are you talking about? Are you including my racquet (see below) in this? Also, when you say players today do you mean pros as well? What about weighted racquets. I think you are implying that it is difficult to hit directly on the sweet spot or Center of Percussion? Oscar can you provide the study on this? I don't know if I am following you so I want to make sure. Doesn't this depend and vary? I do see this but is there a study on it that proves this is the only way pros hit the ball? Can it also depend on grip? Ball height? Player preference? Oscar, please explain this further. There are players (as shown above) that hit above the center to compensate for the collision between the ball and the racquet. Therefore, they will hit slightly ABOVE center so that the racquet squares at impact. Since the ball is only on the strings less than how fast you can blink your eye, I don't understand how you are getting that your way is what pros are doing when it is obvious not all of them are. You are getting into an area that has some variables in it. One of them you mentioned above (net clearance), but come on, a player can hit with a square face and keep the ball safely in the court as well. Hitting the ball with a slightly closed or square racquet is good, I just don't find your information as "the secret" because it isn't. So this is the only problem? Aren't we are talking about variables here Oscar? Swing speed, spin, swing path, how a person uses their legs, how a person uses their rotation, their technique, grip pressure, and what a player is doing with the ball? A player can think about a slightly closed racquet face and drive the ball into the net as well right? A player can think about a closed racquet face and frame it bu misjudging the ball right such as spin and pace off the court?Doesn't Federer frame balls some? Doesn't he hit like you describe? Much of this is a players ability to keep track of the ball and concentrate along with coordinating their swing. Some of it comes from too big of a backswing or overrotation. They also can be out of balance and send the ball into the net or over the baseline. Oscar, I think we are actually going the opposite way not that I don't agree with you. Are we suppose to go out there and think about hitting our volleys in the upper portion of our string bed now? I have never taught nor thought for myself that I should think about this. I can just imagine if I am in a fast exchange trying to make sure I hit the ball at the top of my string bed all the time. It is so much simpler to jsut teach square or even slightly closed when a player hits the ball. Players will find the aread on their racquet that feels best to them Oscar without overthinking how to position the ball on their strings. Never have I see a player have trouble locating the sweetspot on their racquet. It doesn't matter if it is higher, lower, or in the center, the truth is it is even difficult for pros to hit dead center on the sweetspot of the racquet all the time. Wow! There is no substitute for hearing from the author himself. Thank you, Mr. Wegner, for responding. I'm still not clear on one thing. When you talk about hitting below the sweetspot, are you noting an effect of the topspin modern players are putting on the ball, or are you suggesting that players try to make contact with the ball there? I could understand where observation might lead you to the conclusion that the ball is hitting below the sweetspot or at least appears to, given the limitations of human sight. Actually attempting to hit the ball in that area of the raquet face, and to do so consistently, would seem to require superhuman effort. Or are you saying that this is a desireable effect that derives from using a particular technique in striking the ball; that you don't necessarily try to hit the ball below the sweetspot, but following a given technique will render that result? I'd have a hard time getting my mind around trying to use a particular area of the stringbed, especially when it's not the center, to consistently hit the ball. If there's an easy way to do that, assuming it is worthwhile, I would like to hear about it. Seems that ability might have some useful application in areas outside of tennis as well.